Ken over at kwc.org wrote a terrific how-to on shooting bike races, and there's no arguing with results: He got some awesome shots from last year's Tour of California, and from the Sea Otter Classic. With the Tour of California underway, I thought I would expand on Ken's guide. Ken nails down a lot of the technical questions you've got to address, many of which are similar to any high-speed sports shooting: Use the fastest glass (lens with a low numerical f-stop) you can afford, use manual focus when the camera's autofocus can't keep up, and mind your depth of field. I've also been trying to figure this out. 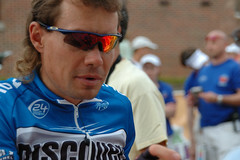 The pictures I got at the 2005 Tour de Georgia were, as a group, a big disappointment. At that point, I was using two point-and-shoots, a Casio Exilim EX-Z30 and a Nikon Coolpix 880. The worst thing of all was the shutter lag. I got into what I thought were great positions for a lot of shots, but I only got a handful of good shots, and plenty like this. That was enough to drive me into the arms of the Nikon D70 (since replaced by the Nikon D80, and very similar to the less expensive Nikon D40). The DSLR has made a huge difference in the technical quality of my photos, and I know, given more money, what I can do to improve that quality even more. A big advantage of the digital SLRs over most of the point-and-shoots is their ability to shoot continuously at 2, 3 or up to 8 shots per second. If you're using this mode, keep in mind that you'll get faster repeats if you're using “JPEG Fine” than if you're shooting in RAW mode, since the camera can write the smaller JPEG files faster. If you're stuck using a point and shoot, try to shoot pictures of the riders before and after the race, or shoot to limit the speed of the action (from in front of the field instead of beside, for instance). Beside the technical consideration, there are a lot of logistical issues to consider about shooting a bike race. For instance, there's only one point in the whole length of a bike race where you're guaranteed to get a good picture that tells a story, and that's the finish line. 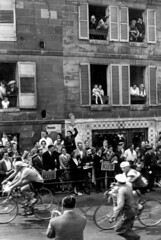 The quintessential cycling shot awaits, of the triumphant rider, arms raised, with a buzzing, colorful peloton just behind. The downside: dozens of other people will get that same shot, including pros set up with tripods just past the finish line. You, on the other hand, will probably have to hand-hold or use a monopod in the heavy crowds around the finish. Pedco's UltraPod is another option, providing a Velcro strap that can be cinched around crowd barriers or street signs to provide a steady mount. So it's key to think about where you want to set up. 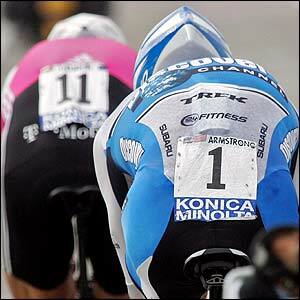 One thing that's awesome about bike racing is the accessibility of riders. Rider warmups before time trial stages are typically wide open to the public, with riders set up next to the team RV, and riders will often work an autograph line on the way to or from the rider sign-in before each day's stage. After the stage, the day's winners and the race overall leaders have to hang around for the award presentation, and you can frequently shoot portraits and shots of riders with the fans. Typically, organizers will set up a cordoned-off area for the pros at the actual presentation, but with a 200mm zoom you usually can shoot the podium from outside the velvet rope. Time trials are fabulous, since each rider will come by in turn. One tip I've used a couple of times: Riders start out from an elevated start house, ride down a ramp into a fenced-off chute, then usually turn as they exit the fenced-off area. It's often hard to get a good spot around the starthouse and storm fencing, but usually a lot more open as the riders exit the chute. 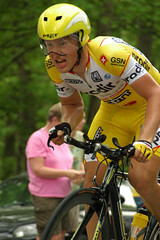 That's where I got this shot of Lance Armstrong at the 2005 Tour de Georgia (still with the point-and-shoot). You'll have a couple of hours of riders coming through every 2 minutes or so, which gives you a great chance to get your settings dialed in. Since the race is on public roads, you can usually get there early, with a load of gear, and set up a tripod and a cooler. It can become almost mechanical, but there are still surprises. At the 2006 Tour de Georgia time trial over Lookout Mountain, I got a good spot on one of the day's toughest hills, and was set up on the left side of the road as riders came through. For some reason, though, the strongest riders -- Zabriskie, Danielson, and Landis -- were among a small minority of riders riding in the center or right-hand side of the road, so my shots of those three key riders were neither as tight nor as sharp as of riders before and after them. Frequently, road races finish with a loop around a downtown area, so you get multiple cracks at the action. Corners are nice, since the riders are leaned over and you can get a lot of different angles by positioning yourself inside or outside the corner. A stage takes as much as 6 or 7 hours to ride, so you can often get more than one look at the riders, bumping up your chance of catching an important breakaway, an interesting backdrop, or a great fan shot. Make sure you've got maps of the area, and plan out how you will get from shooting location A to shooting location B. 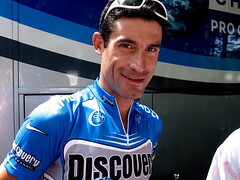 Generally, stage races provide a “race log” that estimates when the riders will reach each intersection at different average speeds. These also help you estimate what's going on in the peloton: If they come in behind schedule, the group is taking it easy. On the other hand, you can easily find your way from Point A to Point B blocked by a breakaway that closes the road, keeping you from making a planned rendezvous with the riders. If you find yourself chasing the racing on a regular basis, you might consider a portable radio scanner. With one, you can listen in to race radio as race organizers track breakaway riders, road closures, and unexpected problems. I've only gone to one mountaintop finish, when Floyd Landis shadowed Tom Danielson to the top of Brasstown Bald last year. 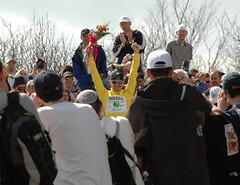 My wife and I went to the top with hours to spare, picked out a spot right along the course, and by the time the leaders showed up, the crowd was so thick that I couldn't get a shot of the showdown, and had to settle for action shots of lower-placed riders and the leaders at the presentation. And keep your eyes and ears open: That woman with the umbrellas and the shawl could be your race leader's mother. A bike race is a great opportunity to try out a new lens (or body). In most cities, there are companies that rent out pro-level photography equipment by the day, week, or month. Day rates typically range from 2 to 5 percent of the purchase price, or $10-$100 per day, with discounts for weekly or monthly rental typically available. Here in Atlanta, for instance, we've got Professional Photo Resources. The reason the pros use multiple bodies is to keep from having to change lenses under fire; they can have a supertelezoom on one body and a wide angle on another. The cool kids at Flickr say “closer is better”, preferring stuff like this and this, but follow your bliss. I like this shot from last year's Stage 6 better than its tack-sharp equivalent, and this pedestrian peloton shot because it may be the last time I ever see Floyd Landis race competitively. Cycling's best-known photographer, Graham Watson, will kick off an exhibit of his work in Boulder, Colorado next week. Watson, who has been photographing the Tour de France for almost 30 years, will sign books and posters at Boulder Cycle Sport Thursday, Feb. 15th from 6 p.m. to 7:30 p.m., in advance of the exhibit opening next door at Amante Coffee at 7:30. The exhibit will run for three weeks, through March 9th, and feature more than 30 of Watson's best photos of European road racing. The exhibit runs from this Saturday, December 9th, through February 17th, 2007. Be there. 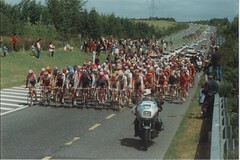 There's an absolutely gorgeous slideshow of Tour images from the '30s to about 1990 available here. It's a collection of mostly black-and-white images from the Magnum photo gallery. There are a few shots of racers, but more of the fans, announcers, and setting of the race. I can't make out head or tail of the commentary, but it appears to be provided by Danish director and Tour commentator Jorgen Leth. I'm pleased and very honored that TdFblog gets a link at the end. Coincidentally, the Magnum in Motion podcast series (RSS/XML subscription link | direct movie link) is currently featuring a similar presentation by Larry Towell on Mennonites, which may be of interest if you would like to learn more about the culture in which Floyd Landis grew up. Sammarye “Velogal” Lewis is stuck stateside for the Tour this year, but she's got pictures so fresh they smell funny up at her weblog. 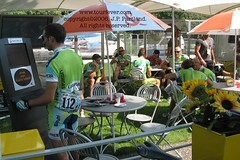 They're by Mark Shimahara, whose BikeZen site will be featuring his pictures from the Tour this year. She's also linked to CarolineYang.com, where we can expect Tour pics. 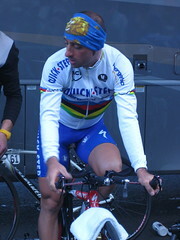 Landis has lost quite a few kgs since the Tour de Georgia; he looks as thin as I can remember seeing him. Cycling photographer Graham Watson was AWOL from stage 6 through 8 of the Giro d'Italia last week. It's not unusual for him to shoot partial coverage of a longer stage race during the early season, when a spring classic might overlap with a stage or two, but it's pretty unusual in a Grand Tour. Turns out, Watson was shooting a rolling birthday party on l'Alpe d'Huez, featuring 7-time Tour winner Lance Armstrong and honoring Livestrong Foundation board member and Austin venture capitalist Joe Aragona. Watson's photo gallery is here: it's fascinating to see the mountain covered in spring flowers instead of screaming fans. If you've ever wondered what Jim Ochowicz rides, you may be surprised: He's on a Team Phonak BMC, while Aragona is on a Specialized, probably hoping to meet the Angel at the mountaintop. Dan Merrick posted some photos of Levi Leipheimer, whose next scheduled race (according to LeviLeipheimer.net) is the Tour de France. I think he may throw another race in there somewhere. The pro photographing the race caught Leipheimer, as well. The rec.bicycles.racing thread the pics spawned is actually worth reading, to boot. 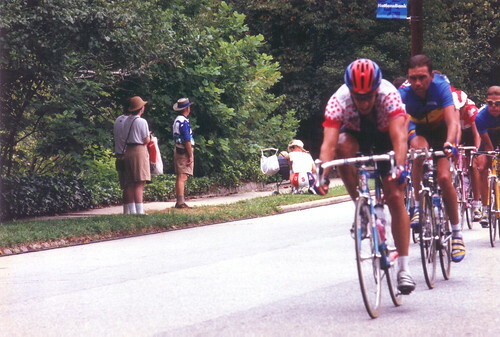 I'm scanning in a bunch of photos from the 1996 Olympic road race, with an eye toward posting them on Monday for the rest day. I couldn't resist posting this one tonight, even though it got pretty blurry when I blew it up to a useful size. In front, Lance Armstrong, 2.5 months from learning he has testicular cancer, is trying to break free of the first pro peloton in the Olympics, but his every move was covered. 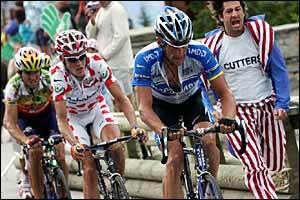 Here, the man shadowing Armstrong is Belgium's Johan Bruyneel, who would help convince Armstrong he could win the Tour de France, and serve as directeur sportif for all six Tour wins so far. Update: I've swapped out the first picture for a better shot my wife took. 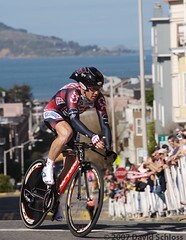 Casey Gibson of VeloNews got a couple of good shots of that finish-line crash today. The first has Galvez down and Furlan just off the deck, and the second is 1-2 seconds later -- you can make out the riders who survived the unusual selection. To the double-truck web press, Batman! One of my year-round daily reads is Mark Friesen's NewsDesigner.com. Mark is a news designer with The Oregonian in Portland, which yesterday published a Tour round-up featuring the amazing infographic above. Byron (of TexturaDesign, Clip-n-Seal, and the Blog Business Summit) IM'ed me this afternoon raving about this “illustrated wonder graphic” in his morning paper, so I checked in with Mark. He has graciously arranged to make it available in all its glory: graphic and design by Michael Mode and Steve Cowden, text by Bonnie DeSimone and James Yu. I initially got a “negative” effect when I opened the PDF in Safari or Preview, but opening it in Photoshop straightened it out, and Mark says he's never seen that issue in Acrobat. Now I just have to find somewhere that can print full-color 22" x 25". Russell Standring has been shooting pictures at every stage of the Dauphiné, and has a nice mix of rider portraits and racing shots. He hasn't posted a page for today yet, but he's named his pages predictably, so I'm adding a link to the gallery he's likely to post sometime today. I've got direct links to some of my favorites, but there must be 150 or more total photos. I love Graham Watson's work, and have a variety of books, calendars, etc., in which it's featured. I had always wondered why, with the technology seemingly available for it, his website didn't offer on-demand prints. He has always sold prints of insanely popular pictures, like the flag cowboy at last year's Tour. If, on the other hand, you're Fabian Cancellara's mom, and you want a picture of him in the yellow jersey after last year's prologue, you've been out of luck. But no more. Now, the great one is offering custom prints of most (all?) the images in his daily race update. Prices range from $82 for an 8 x 12" print to $120 for 12 x 18".